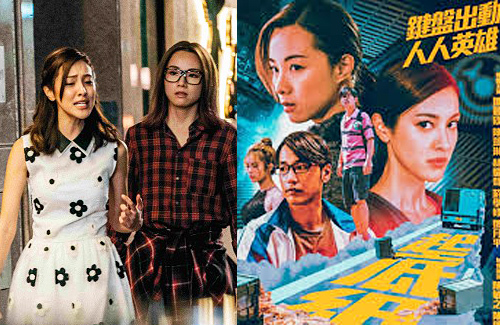 Mei Ah Entertainment released the official trailer for Keyboard Warriors <起底組>, starring Stephy Tang (鄧麗欣), Grace Chan (陳凱琳), Sing Lam (林耀聲), Neo Yau (游學修), and Larine Tang (鄧月平), last week. The film is adapted from a true event in Hong Kong in which an armed vehicle spilled a large bundle of cash onto a busy street in 2014. In Keyboard Warriors, Grace’s character is very materialistic, loves brand names, and investing in stocks. She often argues with Stephy over money. In one scene, the two women were arguing fiercely on the streets of Tsim Tsa Tsui. Stephy pointed out that Grace is willing to drink with men for money. The argument escalated as the two continued to fight and their emotions erupted. Stephy’s face was full of tears as she was so into character that her heart ached. The actress revealed she rarely argues with people, so the scene was comparable to filming an action scene, as shedding tears require a lot of strength. Stephy expressed feeling exhausted after filming that scene. The film is slated to premiere on November 1, 2018. @kuks , Lmao. Very comical indeed. @anon, the current crop of talent is enough to make the sky fall. Well, no sht. Of course we can. @bubbles23 I had to LOL at that comment, too. You gotta love the preemptive strike, though. Now, no one will think unfavorably of her as a person due to her character, otherwise, they are “not smart”, according to Grace. This girl just can’t bear the thought or possibility of any negative criticism. NEWS FLASH: it’s not your character/role we take issue with, but rather your acting ability (or lack, thereof). If Grace Chan had followed what Maggie Cheung Ho Yee did when she entered the acting industry, viewers would be more accepting of her. The fact that she did not work from the bottom-up by appearing in cameo roles, learning from veteran actors, and developing her acting skills over time is what ruined her reputation and career.